Elizabeth Street parking lot, an employee lot at the corner of Transcript Avenue and Elizabeth Street, was recently paved and now open. Photo by Alec Prew. LEXINGTON, Ky. (July 12, 2018) — Construction on University of Kentucky's Elizabeth Street parking lot, located at the southwest corner of Transcript Avenue and Elizabeth Street, has concluded and the lot is now open. The original gravel lot closed earlier this summer to facilitate lot improvements. 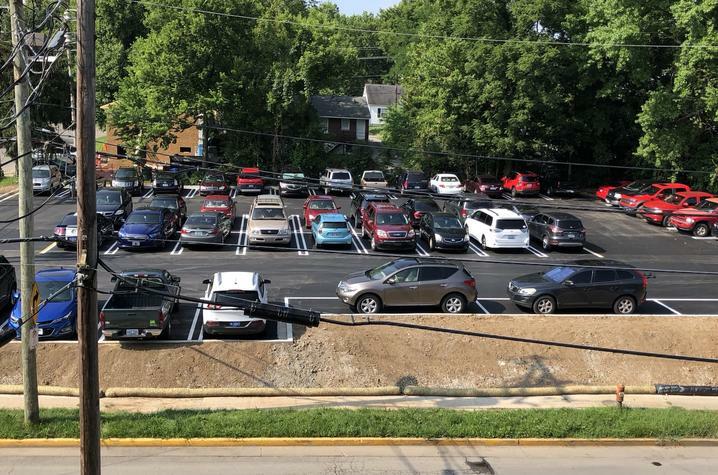 In addition to upgrading the lot from gravel to asphalt, the completed lot now has seven additional parking spaces for a total of 50 paved spaces. The Elizabeth Street Lot is designated as an intermediate employee parking lot (E). For a map of all campus parking areas and their designations, or for additional information about commuting options, please visit the Transportation Services website at www.uky.edu/transportation. Members of the campus community are encouraged to tune into 1700 AM (WQKH 253) to hear campus parking and transportation information. The station broadcasts 24 hours, seven days a week.